We had a very inspiring trip to the Met Museum the other day. Another small exhibition we wandered into was Classic/Fantastic: Selections from the Modern Design Collection. This show had lots of desirable pieces, we'd seen before like the Clarice Cliff pottery and the Henning Koppel silver clam-shaped serving dish, but especially the Taccia lamp, designed in 1962 by Achille Castiglione. We know we've hit upon a favourite when both The Guy and I yell out from opposite sides of the room "I love that lamp". 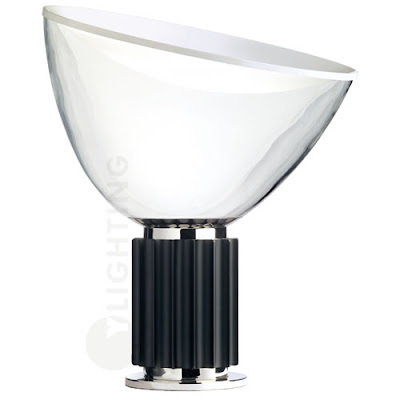 The Taccia is glass floodlight atop a fluted column, it is at once classic and modern and fits perfectly into our style. And we have the perfect spot for it: placed on a plinth in the corner at the top of the front stairs. It would provide much needed light there, illuminate the redwood ceiling and provide something beautiful to look at even when not switched on. Luckily it's still available from Flos via ylighting for $2,548.00. Unluckily we are still forced to endure the fierce frugality measures we imposed at The Cool House in our attempt to mitigate the economic meltdown. It's a good thing we can go check it out at the Met when the need arises, no?